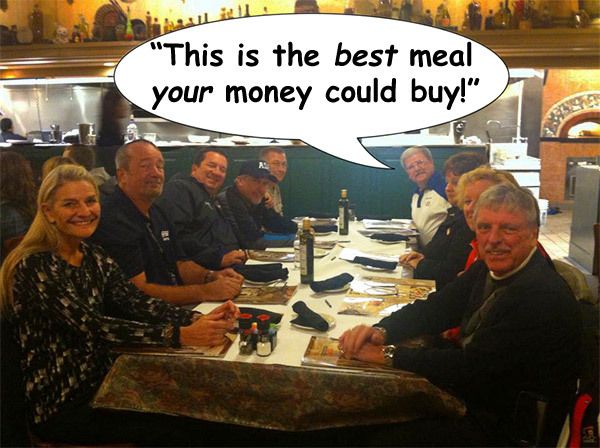 Persing’s Tax Hike – We Told You So! While the Persings were living high on the hog during their trip to Oklahoma City last week, others less fortunate were facing up to the prospect of a huge tax hike for the City. We hate to say it, but we told you so. Rather than a $400,000 budget reduction under Joe Bartello we face a $400,000 increase, following the same well trodden path that Persing has taken before – increasingly wasteful expenditure brought about by irresponsible policies pursued by a corrupt and incompetent administration. Shamokin has already gone down this road and Sunbury is charging headlong in pursuit. When this latest increase proves not to be enough, stand by for an appeal to the county court for an increase in tax limits. Then, rather than going to 25 mil, we can see our tax rates going to 35 mil or even higher – a sure fire recipe for disaster, driving more good people out of Sunbury, leading to increased property blight and a rapidly decreasing tax base. Unfortunately, this time there is nobody in City Hall who will stand up to such profligacy. With the departure of Councilmen Snyder and Bartello and their replacement by the incoming Henry and Reichner, the collective IQ of those running City Hall has probably halved, and Persing can look forward to little or no informed opposition to his misconceived plans for the next 4 years. Responsible and Efficient Administration – Why Not? During the election, Joe Bartello called for responsible administration, for improved efficiency in City Hall, for tax reductions and budgetary restraint, but such appeals fell on deaf ears. There are too many people riding the city gravy train. Wastage, duplication of resources and inefficiencies are all at unprecedented levels. At the end of the day it is the majority – those without snouts in the Persing trough – who are going to suffer, and many of them being the more disadvantaged members of our society. Cutting taxes would be easy and sustainable, but first there needs to be the political will – the will to remove duplication, to cut staffing levels at City Hall to levels which the City can afford, or to do much more work in-house. Why do we have, for example, a City Clerk and an assistant clerk, but still have to use an outside agency – SEDA-Cog – to make all our grant applications – at a cost to the city of up to $100,000 per year? Why are SEDA-Cog even involved in our city? They are what is known as an NGO – Non Governmental Organization. Nobody elects them and they report directly to the White House. Are these really the kind of people we want to be running our city? With Persing abdicating more and more power in their favor, that is the way things are heading. Why do the City pay a building maintenance crew and a cleaning company and also outside contractors? Why is the City Solicitor currently working for 3 city agencies and billing each one separately – and taking home a six figure sum every year? Why should the City Treasurer be given an office manager’s job? Elected officials should not be city employees. Why are none of the major expenses such as insurance or internet or phone ever put out for bid? Why is the City planning to go into debt of up to $300,000 to do unnecessary work at the riverfront? Why do we keep a roads crew and contract out all roads maintenance? Why don’t city employees do the road paving? They are much too highly paid to spend their time cutting grass and maintaining softball fields – tasks which local landscape contractors could do much more cheaply and efficiently. Why can’t the running of the swimming pool, the ice rink, the sports complex, all be contracted out? Why is this idea being fought tooth and nail behind the scenes? Are the losses being sustained by the snack bar, the pool and ice rink even genuine? Currently Sunbury is on a course to economic destruction. Yes, we are going forwards – galloping in fact – right over the edge of the cliff. Don’t expect Persing to do anything to help. He has his sights set elsewhere and is planning to move on to bigger things politically – who knows what rewards could have been promised by his patron John Moran for his acquiescence to plans for the monstrous fracking waste dump, a dump which will now, inevitably, engulf our city. Once that happens, good luck with your “recreational tourism” Mr. Persing! We can’t see too many people wanting to bring their families to Sunbury, the fracking waste capital of Pennsylvania, to subject them to the foul smells of carcinogenic emissions, and to breathe in clouds of toxic or even radioactive dust, while they participate in softball or other tournaments. Here is a final suggestion for you. Why not ask Mr. Moran if he will rename his site the David L. Persing Toxic Waste Complex? – a fitting memorial to your time in office! 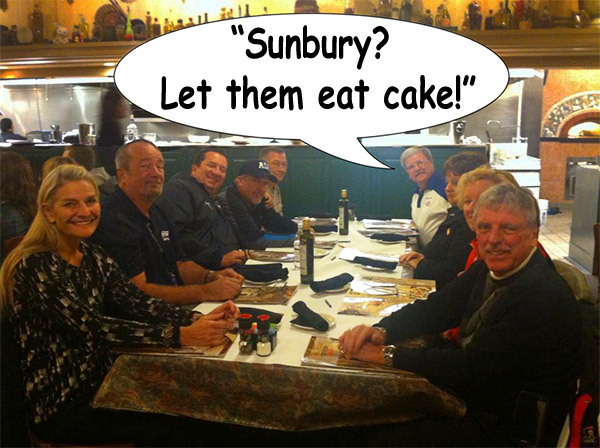 “Sunbury? Let them eat cake!” – from a suggestion by Rogers Roger.